Some of our best chicken tortilla soup recipes. 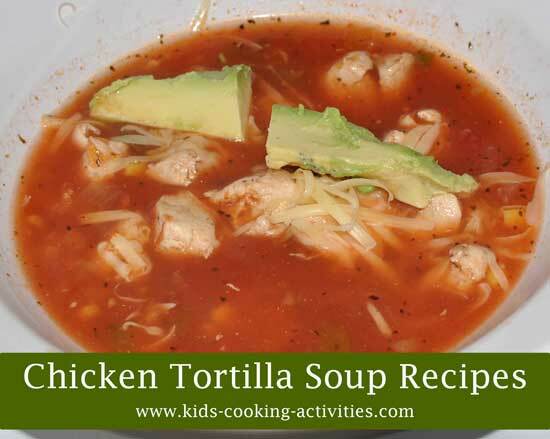 This soup is great served with tortilla chips, chopped avocado, sour cream and shredded cheese. It also freezes well. Share your tortilla soup recipe here. Add chicken and water to soup pot. Bring to a boil. Then simmer 15-20 minutes until chicken is tender. Stir in chopped tomatoes, corn, salsa and lemon juice. Top with avocado, if desired. ~You can saute your chicken in a pan and then add all ingredients together in the soup pot. This will enhance the flavor of your chicken. This soup is a hearty, filling, and flavorful; perfect for a winter evening! In a good sized soup pot, sauté chicken, onions & garlic in olive oil until chicken is just cooked. Add cumin, oregano, paprika, chili powder & salt. Cook a few minutes before adding juice of 1/2 a lime, corn, beans & 32 oz. of the stock. Bring everything to a boil then lower heat to simmer. Add the tortillas and half of the cilantro. Stir everything together well then leave it alone. Let it simmer about 45 minutes, giving it only a few stirs as it simmers. Don't worry if it simmers longer, it's just getting better. If it starts to thicken too much just add a little more stock (or water) to thin it back to desired consistency. Top the bowl of soup with cheese, a little cilantro, salsa, green onion, a squeeze of lime juice, and a dollop of sour cream. Very hearty and filling! 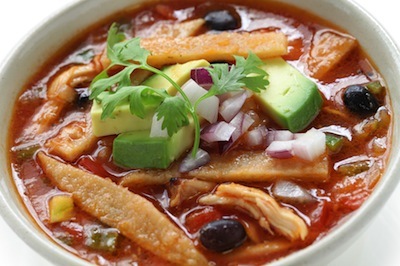 This is one of the best chicken tortilla soup recipes that can be altered to fit any taste buds. Turn the heat on med high, and sauté the onions until translucent and caramel color has begun, 1/2 way through them cooking, add the chopped garlic, cook until roasted and caramel color. Add the Veggie stock and water. I start my soups with my homemade vegetable stock. This recipe calls for 4 cups of stock, so if you don't have your own, store bought, low sodium, would be preferred. Add tomatillos, green bell peppers and hot peppers into the pot and bring to a boil. Let simmer until all the veggies are cooked through, prob about 20-25 min, and at any time add oregano and garlic powder. Take the contents, and service trough a food processor, or a blender if you don't have one. Blend until smooth, and you can't see any of the pepper seeds. Then I add in what I want for this soup, my chicken, beans and/or corn. I wait to salt and pepper to taste until I have all my wanted ingredients in the pot. Some of the canned beans, the veggie stock or the chicken could be already really salty, so I don't season until I have it all ready to go. SO salt and pepper to taste, then serve! You can freeze this, boil out more of the water and use it for an enchilada sauce, but my favorite is to add a dab of Greek yogurt (my trick for sour cream), tortilla chips/strips, cheese, and/or some homemade salsa! *Ground beef with also work, as well. Share your Best Chicken Tortilla Soup recipe?